My latest sweater has had a little bit of an adventure. I bought the yarn (a gorgeous pink called peony) from Eat.Sleep.Knit. back in June after finding a discount code in a site-wide scavenger hunt. The yarn is Manos del Uruguay’s lovely Gloria in a beautiful color called Peonies. And that’s why I’m calling this sweater Nichols. Peonies are my favorite flower, and in my hometown of Ann Arbor, there’s a delightful treasure for peony lovers. It’s a beautiful place called the Nichols Arboretum-or as it’s more commonly called The Arb. Within the Arb lies one of my favorite places in this world-the Arb’s Peony Garden. There are few things that I love more than going to the Arb on a late May or early June evening to explore the peonies. I knew that I wanted to make a sweater with this yarn, but I had other projects on my needles when I bought the yarn. In early September, I “finally” cast on. I knew that I wanted to create something basic and classic. I was also deeply in love with reverse stockinette at the time, and I wanted to let the color (so gorgeous!) do most of the work. 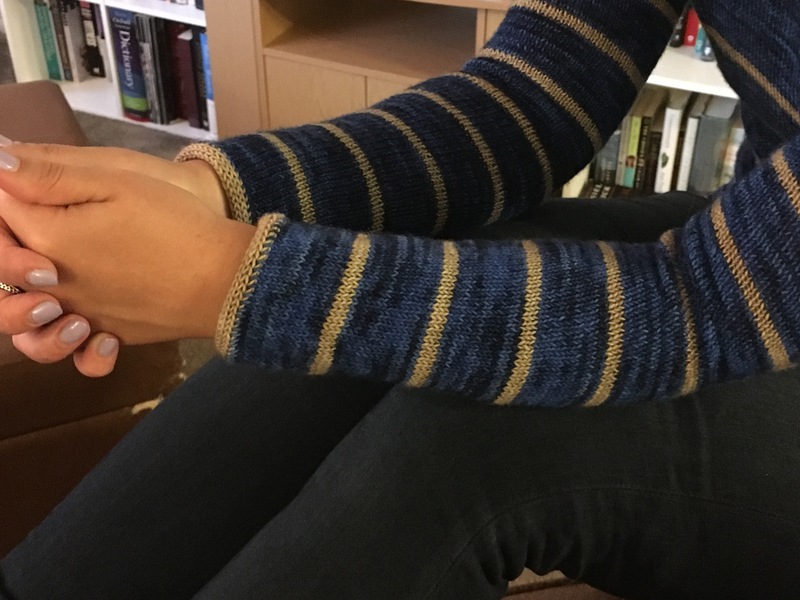 I also wanted to work with a ribbing pattern that I got to knit with when I knit Vaila ages ago. So I cast on for a bottom-up pullover. I included the ribbing that I love so much. And then after a few weeks, I put it aside to work on my Tensho pullover. But when that was done, I took the pink pretty back out and worked on it a bit more…until I started working on Lillet. When I finished Lillet, I started working on another project that’s still a WIP. The pink pretty stayed in a bag-until the polar vortex hit the Midwest. 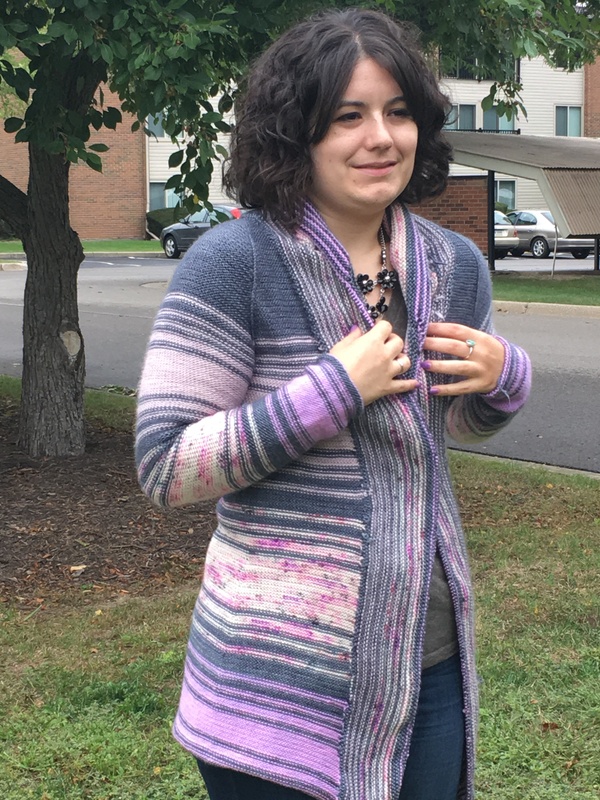 See..the WIP is a cropped cardigan. It’s lovely. But I couldn’t justify focusing on a cropped anything when I was looking at a week of days with high temperatures of negative Fahrenheit. So I pulled out the pink pretty and put the cropped cardigan back in one of my knitting bins. I told myself that every day that I had a snow (or ice or cold) day, I could work on the pink pretty. No snow day, no pink pretty. Well, Monday was a snow day, so I worked on the pink pretty. Tuesday, I had to work, BUT I knew by the time that I got home from work that I didn’t have school on Wednesday or Thursday due to distressingly cold temperatures, so I let myself work more on the pink pretty on Tuesday evening. I worked on it on Wednesday and Thursday. And on Friday, with another day off due to excessively cold weather, I finished the pink pretty. And now it’s back to the cropped cardigan. If you’re wondering how I made the pink pretty, I’ll give you a basic rundown. I used size 9 needles for the ribbing and size 8s for the stockinette. I used the cast on directions for Vaila because I knew that it would work for me. The ribbing of the sleeves and body are the same length; the ribbing on the neckline is only about nine rows. I didn’t want a cowl neck on this sweater; I just wanted a plain crewneck. I worked the body with a bit of waist shaping, but the sleeves have no shaping. I wanted something simple and cozy. 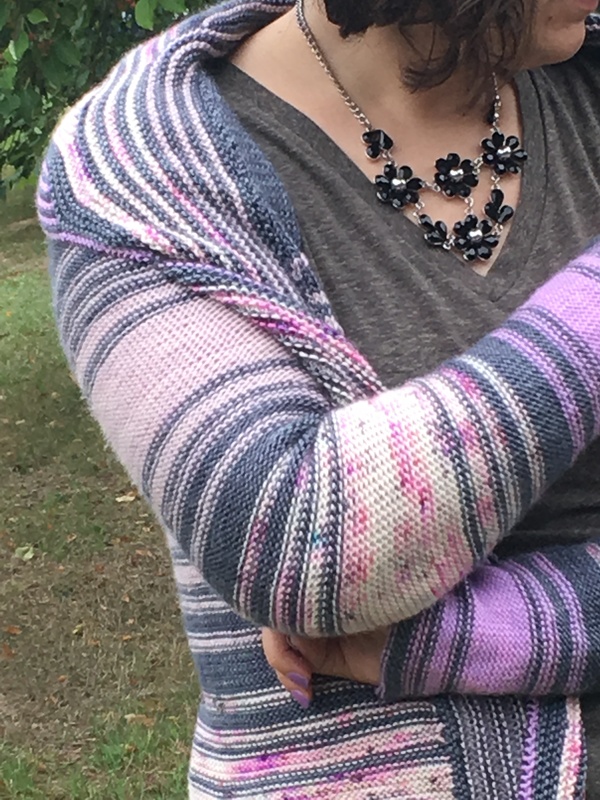 I put some short rows in the yoke because I wanted a crew neck feel; I didn’t want a boat neck, which was where I felt that I would have gone if I’d left out the short rows. On New Year’s Day, I was talking to a (quite stylish) friendly acquaintance about my knitting. She commented that she likes that I don’t just knit lumpy, mismatched socks; I knit clothes that are actually attractive. My latest FO is definitely something that is attractive. 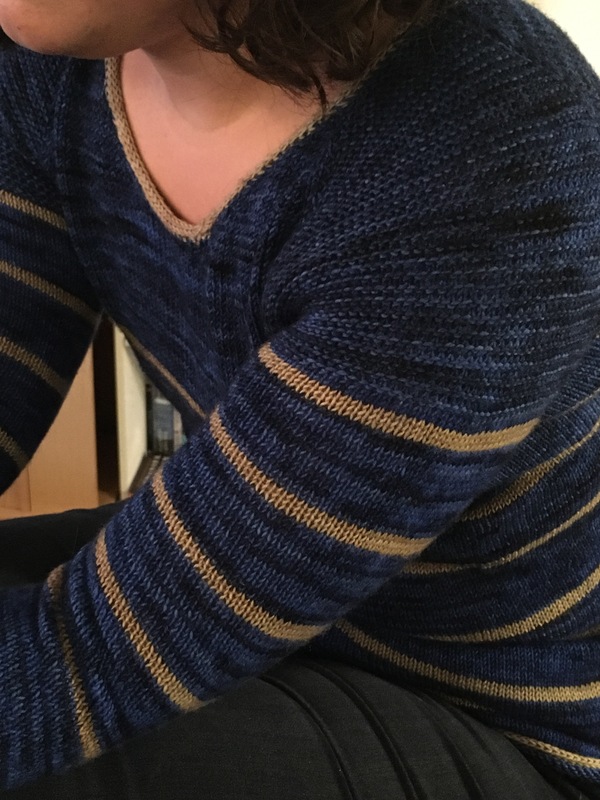 My latest FO, Lillet, is a design from (wait for it) from Thea Colman. Yet again, I’ve been testing for one of my favorite designers. (Lillet is named after a liquor that goes into one of my favorite cocktails, Corpse Reviver No. 2.) This design is a simple, classic pullover with a fun lace and cable detail on the neck. It’s knit top-down with a worsted weight (I used Julie Asselin’s Nurtured). It requires an understanding of short rows, cabling, lace, and knitting in the round. But overall, it was a very easy knit. The charts and directions included in the pattern are easy to follow. One thing that’s fun about this pattern is that there are two different lengths. 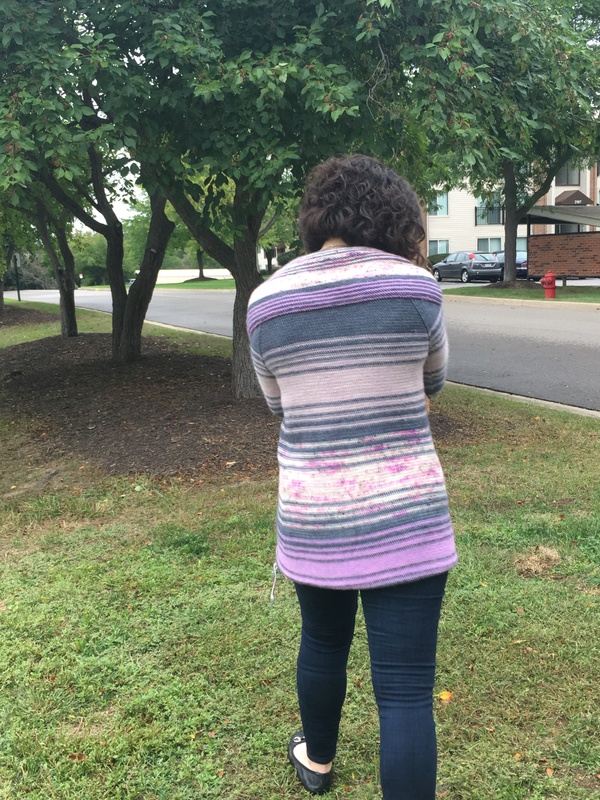 I knit the longer version, which features a longer back. 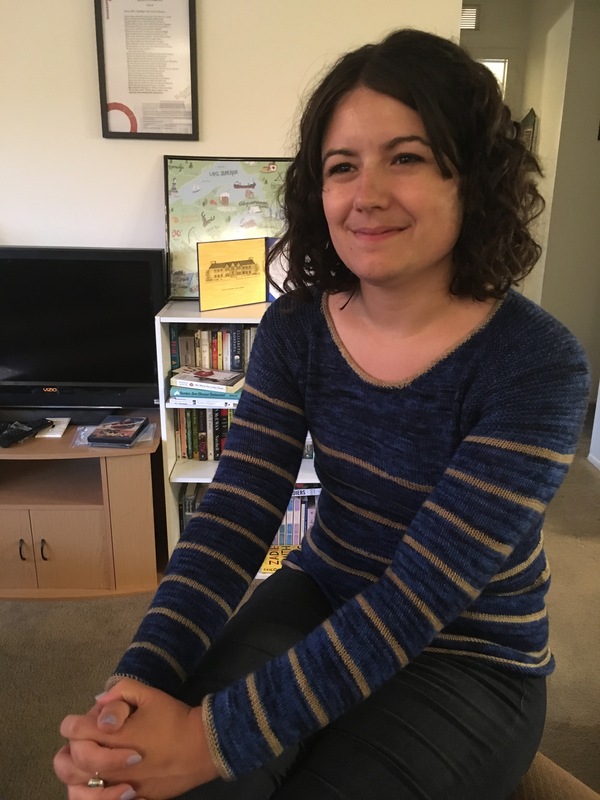 I like the longer sweater, and the extra length in the back is kind of great because I (to quote the incomparable Dinah Lord) “hike up in the back.” There is also a cropped version of this sweater. (Directions for both are in the pattern.) I can see the cropped version being super cute over a dress or with a pair of high-waisted jeans. Now let’s talk about that yarn. I’ve heard of Julie Asselin and her yarns before, and when Thea offered a discount code for her testers if we bought straight from Julie, I knew that I had to jump on this chance to try something new. Nurtured is a merino/rambouillet/targhee mix, and it’s a good solid yarn. I like the way that it felt under my fingers as I knit, and I’m quite certain that it will keep me warm on some of the many cold Michigan winter days coming our way. The color that I chose to work with is Dew. Now, from a distance, Dew looks like a dark creamy or a pale grey, but when you get closer you see it for what it truly is-an utterly beautiful opal. My fibre-loving friend, Laura, was looking at it one day recently and commented on seeing pink, blue, yellow, and green in it. As someone who owns both a pair of pale blue pants and a pair of pink pants, I can’t wait to see how it plays with each of those respective colors. This one is all Melynda Bernardi’s fault. Ever since she posted this picture on Instagram in February, I’ve known that I needed to own a Tensho Pullover. 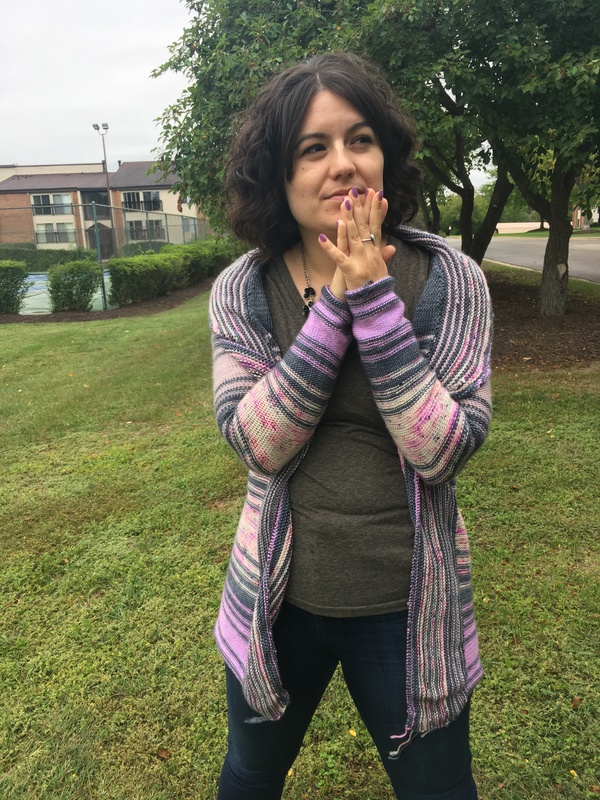 In fact, I bought the yarn to make this sweater the very day after Melynda posted that pic on Instagram. Well, I bought my main color; I already had the contrast color. I got the contrast color (beautiful, beautiful Muro from Manos del Uruguay) thanks to my Eat Sleep Knit Yarnvent Calendar from last year. As soon as I started scheming my Tensho, I knew that I had to incorporate the Muro into it. So I bought five skeins of Manos del Uruguay’s Gloria in Petunia. I knew that these colors had to be together. But it took me until this fall to get my act in gear and knit the sweater up. My motivation to knit up the sweater? The ESK fourth quarter (October through December) knit-a-long is all about charted knitting. I needed a pattern that used charts for the main focus of the design. Tensho fit the bill. The yarn I used is Gloria (worsted weight) from Manos del Uruguay. Now, Manos makes beautiful yarn, and that in and of itself gets my attention. But the story behind Manos really gets my attention. It’s a cooperative business owned by women that supports women. A business that encourages and supports women-sign me up. (ESK, by the way, is also a women-owned business.) 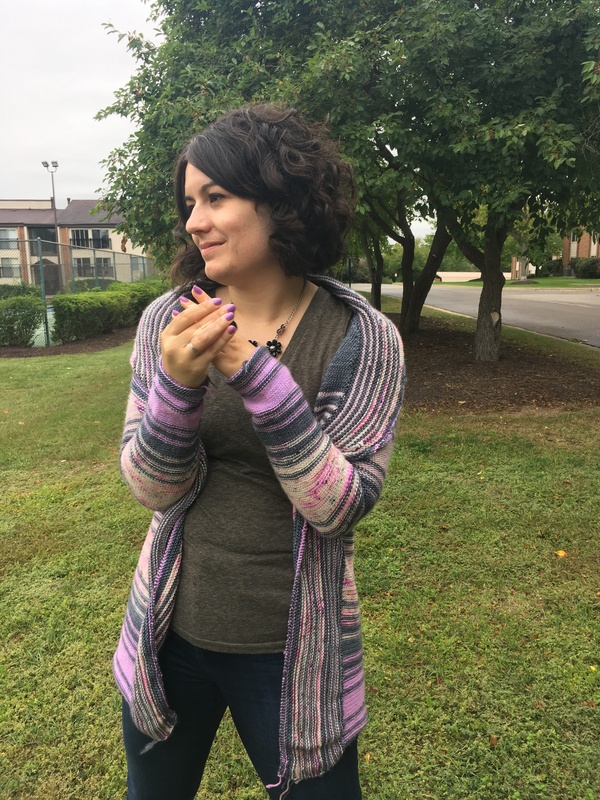 I was thrilled to have the Manos yarn in my hands because it allows me to support women. I can’t say enough good things about this pattern. It was a quick knit, and the colorwork charts are very easy to follow. The finished product looks beautiful but doesn’t actually take that long to make. It’s a cozy sweater. Today may have been a bit warm for it, but I have a feeling that it’s going to get a lot of love this winter. 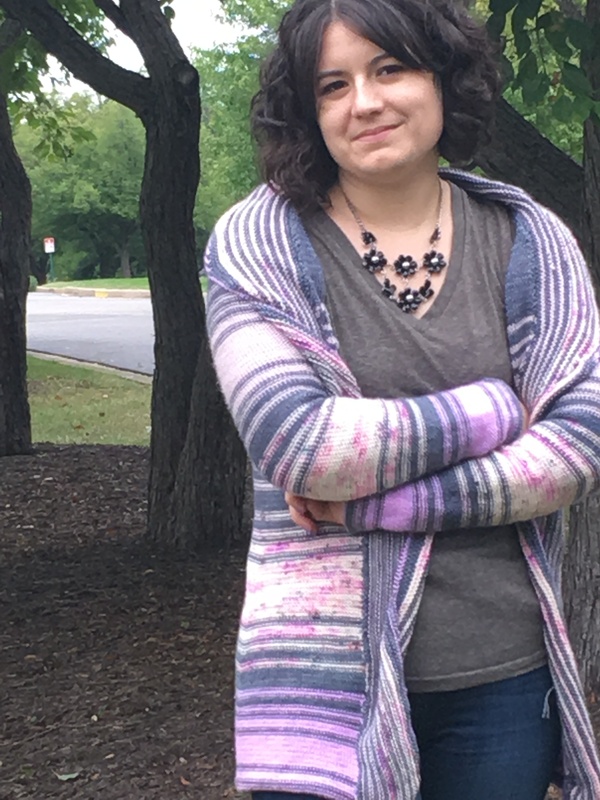 Several previous knitters of this sweater commented on Ravelry about it being a good sweatshirt-esque sweater, and I agree with that. It’s cozy and snuggly. The yarn helps with that. This evening at dinner, my friend Liz was stroking the yarn and admiring how cozy it is. Gloria is a soft yarn, and it works well for the color work. I’m using it again for another sweater that I’m already working on, and I’m a big fan of it. I love it for a good warm sweater, and the colors are utterly beautiful. I love to read. I don’t think that’s any secret given the name of my blog, the sources of the names of the knitting patterns that I designed, or the things that I choose to blog about. I’m a woman who loves to read, and I’m proud of that. But before I was a woman who loved to read, I was a girl who loved to read. And I became that girl because my mother was a woman who loved to read and shared that love with her children. One of the most valuable gifts that my mother ever gave me was a library card. I don’t remember when I got my first library card; I just remember having one. I remember going to the library with my mother and brother from the time I was a little girl. Sure, I owned books. I was given books as gifts at Christmas and my birthday. I was given gift cards to bookstores that I used to buy books of my choosing. I occasionally bought books with money that I got for holidays or for my allowance. I bought books from the Scholastic book order. But more than that, I had the library. When I was in elementary school, I lived in Jackson, Michigan, a city that is home to a beautiful Carnegie Library. Now, the whole purpose of a Carnegie Library was to provide books to everyone. Andrew Carnegie, as I understand, believed that everyone should have equal access to learning and literacy. I know that this library provided me with that. I have numerous fond memories of sitting in that library looking for books to read. I checked their illustrated copy of Peter Pan out more times than I can remember because I loved both the story and the beautiful illustrations. I read all of P.L. Travers’s Mary Poppins books cover-to-cover multiple times. The children’s fiction section of that library remains in my memory as an oasis of calm despite the fact that I haven’t been there in more than 18 years. I read and explored in that library and later in the Ypsilanti District Library (YDL) branches near the home my parents have lived in since I was 12. I explored the school libraries in which my mother, an elementary school librarian and media specialist, worked. I found new books to read and rediscovered old friends. I explored new worlds and learned new words. When I learned to drive, one of the places I went most frequently was the library. I found another oasis of calm first in the young adult department and later in adult fiction at the YDL. I first met Dostoevsky there. I read all of their Mary Higgins Clark…until I got tired of her formulaic style. I learned what kinds of books I like and what kinds of authors I enjoy. As an adult, I love my local library. While I tend towards the branch closest to my home, I’ve been inside of all of the Ann Arbor District Library’s branches at least once. (The downtown branch is my favorite. They have the dollhouse that enchanted my early childhood in the children’s department.) I love roaming around the library and finding new books to read. I like seeing other people find new books to read. Talking to librarians is so delightful. I’m forever requesting new books to read; I love taking my GoodReads queue and requesting more books from it from the library. That isn’t to say that I don’t buy books. I do. I own many, many books. I’m happy to. But the library remains my greatest gift. I can try new things. I can explore new worlds. Unless I have some reason to expect to fall deeply in love with a book-or take longer to read it than the library will let me have it for, I tend to only buy books after I’ve read them at least once. But the library allows me to “try before you buy.” And I love it for that. Libraries are incredibly important. They allow us to explore the world through books. Libraries have helped me to explore the worlds of fiction and nonfiction. If, as it has been said, we read to know that we are not alone, then libraries are one of the strongest beacons to reassure use that we are not, in fact, alone. To begin with, I’d like to thank Amazon Prime Video for releasing the first seasons of Tom Clancy’s Jack Ryan the weekend that I started knitting the 102 row collar of this sweater. I don’t know where any of us would be without you. I’d also like to thank Netflix for letting me binge The Office while knitting and Emily Blunt for letting the rest of the world ogle her husband. He’s not to hard on the eyes. I like the fade method that Andrea uses in the pattern, but I decided to use this pattern to help use up some of the seven skeins of slate gray Tanis Fiber Arts yellow label in my stash. 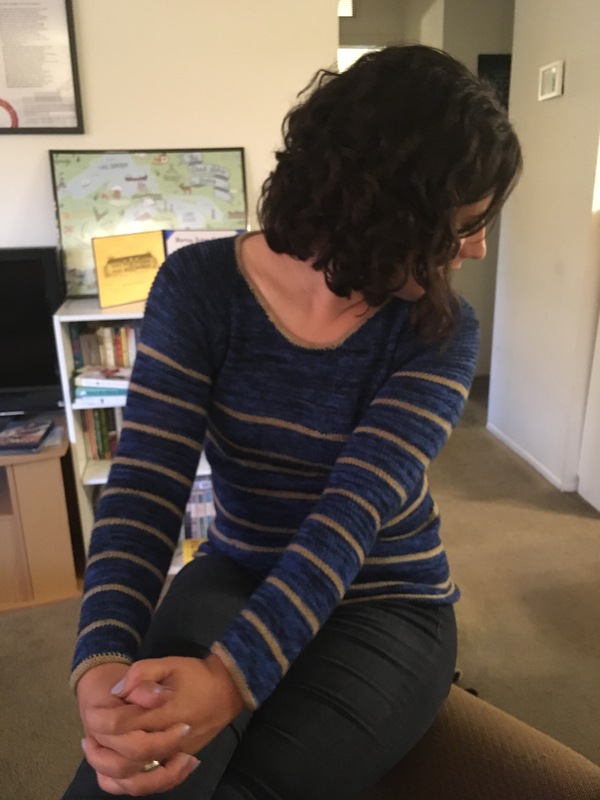 My initial plan was to make a striped sweater using the aforementioned slate gray along with the one skein of spun sugar yellow label. But then I saw a friend wearing a sweater (presumably store-bought) with white as the main color and several different colors of stripes. And I fell in love. I wanted a sweater like that, and I decided that I’d make my Comfort Fade like that. Slate gray became my base color, and I used three and a half skeins of that. The first stripe is the spun sugar that I loved and wanted to use with the gray. Then I bought two skeins of Hedgehog Fibers Merino DK-one of cheeky (the second stripe) and one of cheeky (the third stripe). I modified the pattern a bit here and there beyond the color combinations. I worked the hem of the body in stockinette rather than ribbing. It may curl up more this way, but I’m not particularly keen on the way the ribbing would have looked. I also cast off using a different method than recommended-again because I preferred the look. I’m really thrilled with the way that it all turned out. I love the way that each of my contrast colors plays withe slate and the way that they contrast against one another. I love the way that cheeky and slate work on the collar. But oh man…that collar was a doozy to knit. It’s not hard to knit, but it took a long time. 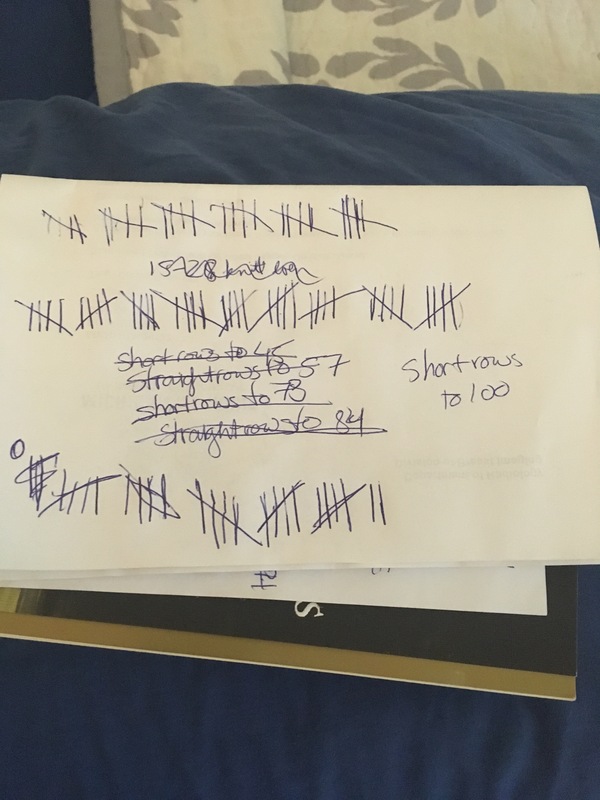 I had half of the stitches on one circular needle and half on a second so that I could keep track of everything. And then I had a piece of paper that told me what row I was knitting and how many more rows I needed to knit in either short rows or long rows. It was intense. The final product is gorgeous, but it was an intense week of knitting that part. This definitely isn’t a sweater that I can wear with every outfit in my wardrobe. I’m not sure how it will look with some of the blue that dominates my wardrobe. But I know that it will add a needed pop of color to my more neutral outfits. It’ll also be that warm snuggly hug that I need during the winter. (Both of the yarns that I used are QUITE cozy.) And I can wear it either with a nicer outfit (church or work) or for more casual occasions. Now, I’ve said that I really like this pattern and Andrea’s patterns in general. So, would I knit it again? After the numerous hours that I’ve spent pondering the attraction of John Krasinski’s face…errr, watching his TV shows…this week, I’m not sure. That collar took a long time. It’s gorgeous, and I love it. And I might need another one of these sweaters. But it’ll be a while before I come back to it-and not just because I have other things that I want to knit. That said, I’ll be back to ogling John Krasinski’s face again soon. It’s a nice face. Growing up, I regularly heard people encouraging me (and my peers) to be nice. Be nice to her. Use nice words. Let’s just be nice. He’s a nice person. She’s trying to be nice. I didn’t think much of the word. It was just a word that people used. I paused. Nice is a terrible thing to call a person? But I thought that nice meant, well, NICE. It’s pleasing and agreeable and good. Everyone is always telling us to be nice. What’s wrong with being nice? So I looked the word up. The first two definitions aren’t terrible. They’re what I was used to. But let’s look at the third one. “Showing accuracy, precision, skill, tact, care, or delicacy.” That’s what Sir Ian was talking about. But if you keep reading, it gets worse. Delicacy, finicky, and fastidious are all words that come up. These aren’t things that one wants to be called. But, according to the dictionary, that’s what being NICE is. Now, you might be wondering why I’ve been thinking about this? For various reasons, I’ve been listening to the soundtrack to Sondheim’s Into the Woods over the past several months. And when I’m not drooling over Meryl Streep’s gifts or Chris Pine’s partially bared chest, I’ve noticed a few things. Little Red Riding Hood is the first one to really bring up the topic when she determines that the Wolf seems nice but despite that exterior is not actually good. Nice, according to Red’s presentation, has to do with appearances and the exterior. Good is what lies within a person. The Wolf had a charming or pleasing exterior, but he meant no good to Red or her grandmother. He used his niceness to manipulate others into doing what he wanted. The Witch continues the conversation near the end of the play when she says “You’re not good. You’re not bad. You’re just nice.” Nice doesn’t solve problems-and these people are facing a giant problem. Nice might seek to place blame, but it doesn’t get rid of the problems. It doesn’t matter how it started; what matter is THAT it started. “I’m not good. I’m not nice. I’m just right.” The Witch sees the problem with being nice. Nice is superficial. As I said when discussing Red’s song, it’s about appearances. Nice isn’t necessarily a bad thing to be, but it is superficial. It’s agreeable. It’s tactful and accurate and delicate. Those are useful things at times, but they don’t get rid of the Giant’s Wife. One of the themes of Into the Woods is the difference between the surface and the heart. Prince Charming says of himself at one point that he was “raised to be charming not sincere.” I once read or heard an interview in which Chris Pine (who plays Prince Charming) describes his character as two-dimensional. Nice is fine for two-dimensional situations. But real life, as Pine seems to be aware in his commentary on his character, is not two-dimensional. Real life is multi-faceted. It really doesn’t matter whose fault it is that the Giant’s Wife has come out of the clouds. It’s not only one person’s fault. There is plenty of blame is spread around. That’s real life. It’s multi-faceted. Most people are not just good or just bad. Nice isn’t always the answer because the heart of a person matters far more than the surface appearance. Inside, we are all imperfect. We are all to blame for some thing in this world. We all make mistakes. We all do and say things that hurt others. The scene from Wonder Woman linked above is one of my favorite scenes in the movie. Steve Trevor (played by the above average Chris Pine) tries to explain that right and wrong are not simplistic things. Every person is responsible at some level for the darkness in this world. Maybe he personally didn’t cause World War I, but that doesn’t mean that he has led a life without any error or any harm to others. But at the end of the day, we’re not meant to go through life like that. We are meant to leave this world better than we found it. That isn’t easy. The end of Into the Woods finds the main characters trying to figure out how to move forward with their lives. Their world has been changed by witches and magic beans and giants. But as the deceased Baker’s Wife reminds her husband, we do not move through life alone. No one is alone; we have friends, family, and other networks to help us to through the good and bad of life. Our lives impact those around us. We need to think about how our lives impact others. Our actions and words impact others longer than we may realize. Niceness often is only beneficial in the short term. While it can be difficult, it’s important to think about how words and actions impact others in the long-term. NB: I know that this post may make me seem like a huge Chris Pine fan. I assure you that it’s just mere coincidence that the two films that had the best support for my nice versus good argument also featured Chris Pine. 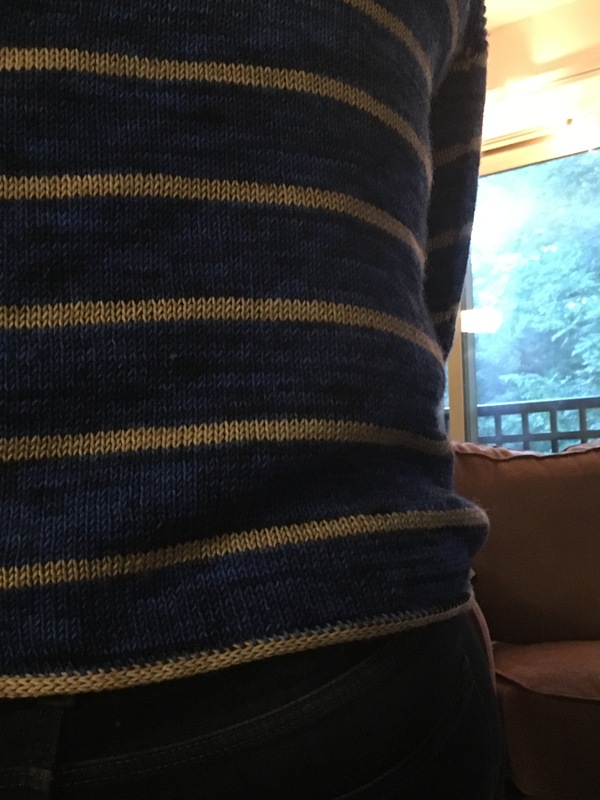 I love Breton style sweaters, and I spent a long time wanting to knit one. About a year ago, I got my hands on three skeins of Plucky feet in a gorgeous color named Wentworth after Captain Wentworth from Jane Austen’s Persuasion. Captain Wentworth was in the Navy, so I thought that these might make a good base for a Breton sweater. Then I started digging through my (too extensive) stash of Plucky Feet, and I found a yellow-leaning tan skein Great Outdoors that I felt contrasted well with Wentworth. 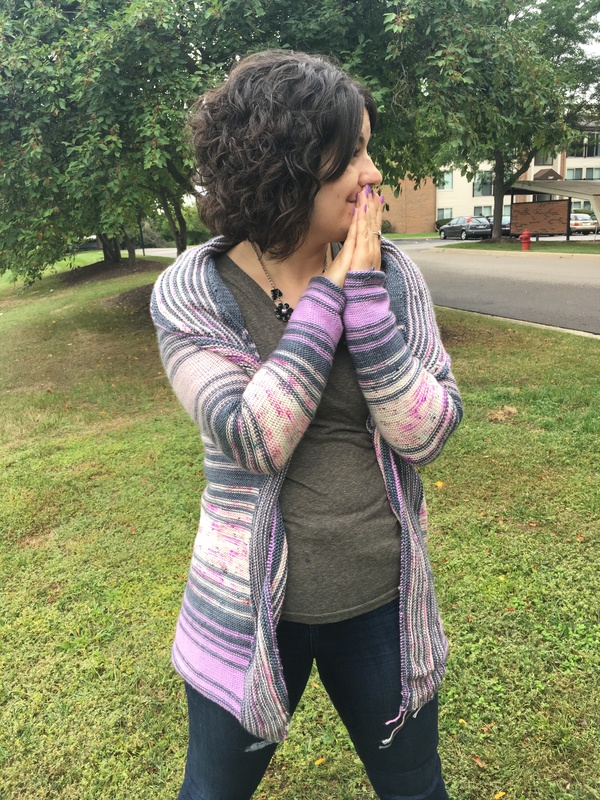 I then decided that So Faded by Andrea Mowry, a pattern that I’d knit and loved previously, would work as a guideline for this sweater. I cast on. And then I got distracted by another project for a friend. And then along came a few test knits. And other things distracted me too. But in early June, I decided to buckle down and focus on finishing my sweater. So Faded is a great pattern. Andrea has created a beautiful pattern that is easy to follow and easy to adapt. I love my faded version, and I have a feeling that I’m going to be equally fond of my Breton version. I did make some modifications for this. Instead of ribbing on the hems and neckline, I knit an i-cord. I felt that it added a cleaner edge. I’m not the world’s biggest fan of ribbed edges, but I love a clean i-cord. I’m really pleased with this sweater. The colors play well together. Plucky Feet is a great yarn for a lightweight sweater; it’s nice and cozy. I’m looking forward to getting to use this when fall comes…but don’t worry, fall; you don’t have to come just yet.